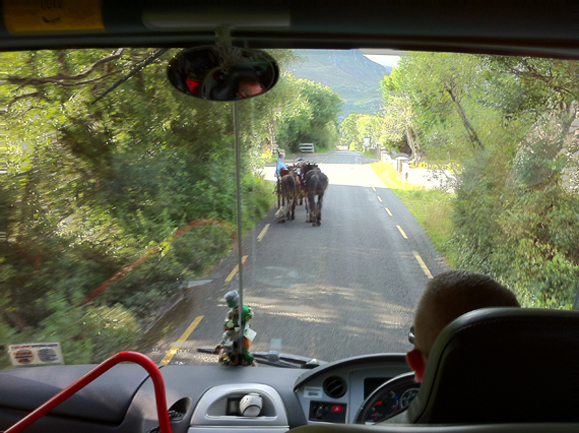 The view from the front of our CIE coach on the Ring of Kerry. All photos: Tara Dougherty and Sheila Langan. 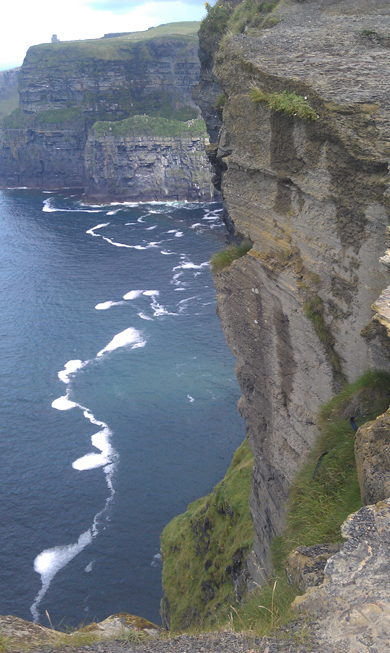 CIE Tours International’s Taste of Ireland Tour is a trip not soon to be forgotten. 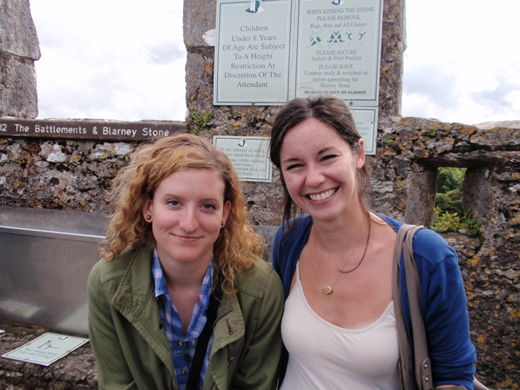 Irish America sent Tara Dougherty and Sheila Langan to discover its splendor. 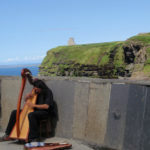 Scroll down for more photos and a chance to win your own 5 day/4 night Taste of Ireland tour for two. Perhaps the sentiment you hear most about Ireland is just how nice the people are. For years I’d heard it, that the most striking element of the country was the warmth of its people. It may be my own cynical New York mindset but I couldn’t help but think, “How nice could they really be?” After the trip, I was singing the same tune as all those I’d known. Having grown up a competitive Irish dancer and later studying Irish literature, music, history and language in college, it seems like part of me has always been in Ireland. So much of the music and culture of Ireland has been an integral part of my life and identity that it felt almost strange to be visiting the source of it all for the first time. Ireland has always had a mystical quality for me, and to say that my expectations were high would be quite the understatement. I was not disappointed. 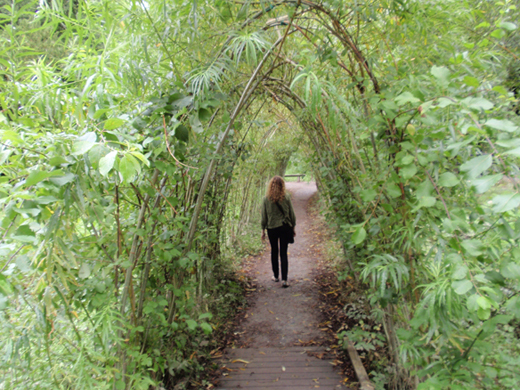 From ages one to fourteen, a trip to Ireland in August was part of my yearly itinerary. My granny’s birthday was on the 1st, and that cause for celebration, combined with the prospect of 9:00 pm twilights, would bring my relatives back to Ireland, to Kerry, in droves. Days were slow and lazy – I was stubborn about adjusting from jet lag, preferring to wake at noon and go to sleep after midnight. We visited neighbors, packed blankets and banana sandwiches for a day on the beach at Banna Strand. Nights were spent sitting together by the fire, eating Irish apple pie (tart, with whole cloves) and playing rounds of Old Maid and Thirty-One. 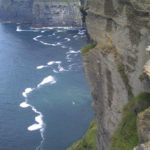 My last August visit to Ireland had been in 2008 – a heavy and strange time to be there, due to the impending financial bust – when I spent two weeks with family in Naas and Dublin before starting a busy semester at Trinity. This – being with family – is what Ireland in August has always meant to me, and it’s a hard memory to live up to. But when presented with the chance to return with the CIE Taste of Ireland Tour, I leapt. This would be a trip on different terms and from different eyes. 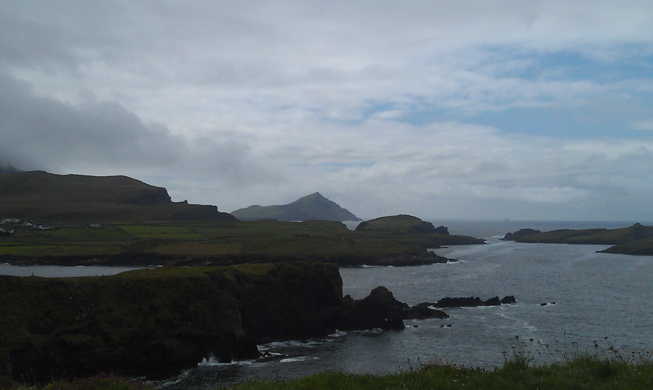 For the first time I would be seeing Ireland not as a daughter or granddaughter, or as a student, but as a tourist. And instead of nestled with my own, I would be part of a 30-person CIE tour bus family as we rolled through countryside from Dublin to Kerry and back again. Sheila Langan and Tara Dougherty. The trip began with a 5:00 am landing at Dublin Airport. Exhausted from the time change and a mostly sleepless flight, we spent the first day touring Ireland’s capital in a daze. 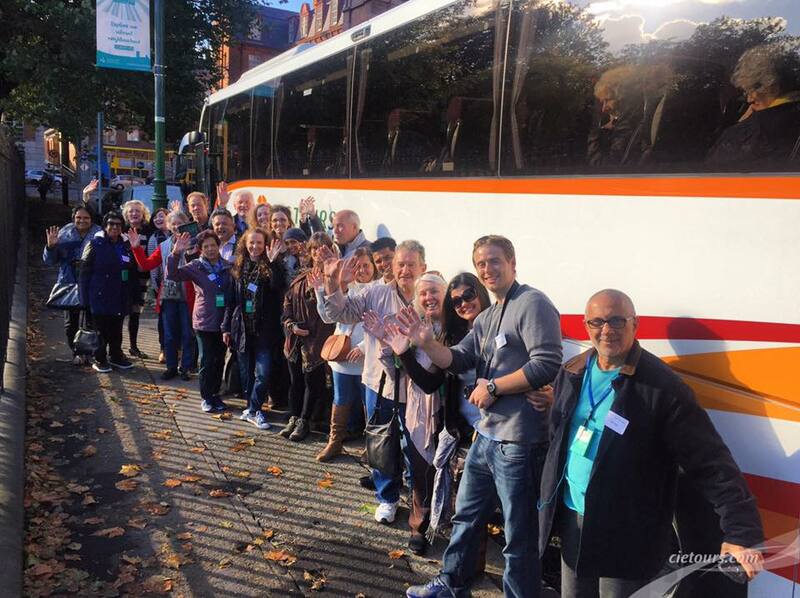 The absolutely wonderful thing about a bus tour, though, is the luxury it affords you to sit back, relax, and let yourself be ferried from place to place – your only responsibilities are to be on time and take it all in. 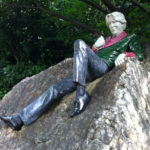 So it was all right that our first few hours on Irish soil were a pleasant blur of St. Stephen’s Green, O’Connell Street, Dublin Castle, the cheekily lounging Oscar Wilde statue and the Merry Ploughboys Pub in Rathfarnham. 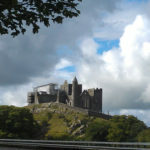 The following morning we traveled south and west, stopping to take in the Rock of Cashel and to give the Blarney Stone its customary kiss before arriving in the lovely Co. Kerry town of Killarney, where we would be spending two nights. 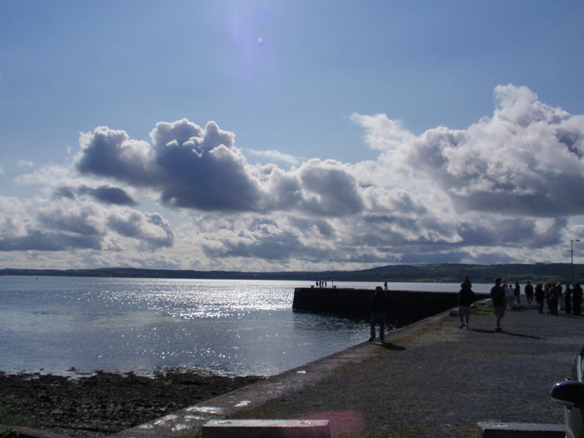 The third and fourth days took us through the hills, valleys and seaside cliffs of the Munster landscape, then across the River Shannon via car ferry and on to Bunratty Castle and Folk Village. 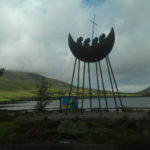 The final day was spent returning to Dublin after an all-too-brief stop in beautiful Connemara and Galway City. Our first of two nights in Killarney was the most Irish night of our stay as far as the weather was concerned. We wandered the streets through a downpour, shoes soaked, umbrellas snapping in the wind, just trying to find the perfect pub to hear some music and get a feel for the town. There are over 50 pubs in Killarney, which is not very big, so it wasn’t as though we were lacking in options. Dodging a tourist trap or two, we settled on a smaller pub, the Dunloe Lodge, drawn in by the lively tunes of a few men on guitar, fiddle and button accordion. Unfortunately, just as we arrived they were wrapping up their music seisún. Seeing some stylishly dressed ladies around our age who had been enthusiastically singing and dancing to “The Fields of Athenry,” we decided to take a chance on asking for a recommendation. We only got as far as, “We’re not from around here and we’re looking for…” before we were instantly adopted. “You’re coming with us!” they declared, and with that a few girls visiting Killarney from Galway City became our personal social tour guides for the evening. They swept us up Plunkett Street and down Main Street to Sheehan’s at the Killarney Grand. Inside, we did not find the absorbing seisún we had been looking for, but we did find, performing live, a group called J90, who turned out to be the best top-40 cover band either of us had ever heard. Even though they were performing contemporary hits, it was unlike anything you would see in the U.S. – especially on a Monday night. They were a modern-day equivalent of what the showbands of the ’50s and ’60s must have been, and, judging by the crowd and by the praise of Neill, a farmer who drives into Killarney every Monday to see them perform, just as popular. The resounding lesson of the night was a valuable one, especially for a pair of slightly guarded New Yorkers with exacting expectations: if you go traipsing around dead-set on finding the authentic Irish experience, chances are you’re not going to find it. Better to take it all in, talk to people and enjoy what’s really going on. The grounds and gardens of Blarney Castle. The CIE Tour gave us the unique experience of interacting daily with a large group of fellow tourists. While this may not sound appealing to everyone, there is no quicker way to learn about the sheer magnetism of Ireland; the pull it has on so many people from different places and of different ages. We shared a few meals with our fellow CIE-ers, told our own stories and heard many more, and the theme of our conversations seemed to always harken back to family. Of the thirty or so on our tour, we were just about the only ones traveling without a relative. Two older couples from the Mid-west were making the trip together – an epic double date by any standards. Chuck and Katie Cavanaugh, a father and daughter from Connecticut, were celebrating her high school graduation, and the Bachmans, a mother and her two daughters from New York, had also come to Ireland to celebrate the younger girl’s commencement. We could see these groups bonding with each other and with Ireland itself. Another mother and daughter by the name of O’Brien, visiting from Florida, were excited to encounter the popular O’Brien’s chain of sandwich and coffee shops, and were even more delighted to learn that Bunratty Castle (which we visited on our fourth night) had been owned by the O’Brien clan. “We’re royalty!” they exclaimed. The stories and connections went on and on in our bus full of families. Along the road we encountered another CIE group of over 30 brothers, sisters, aunts, uncles and cousins on a family reunion through Ireland and Scotland. They were on a quest to find a connection to their roots, but more importantly, it seemed, to renew their connections with each other. 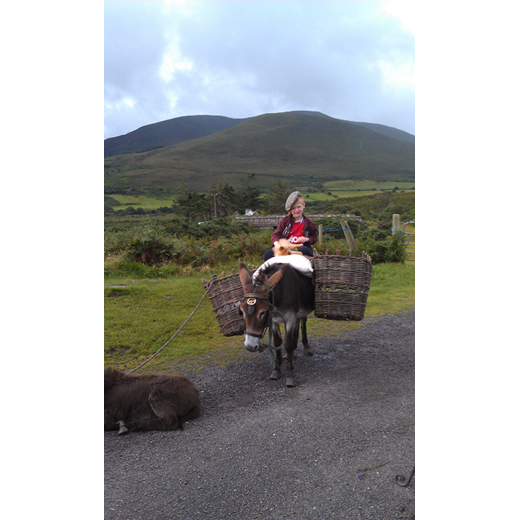 A young boy poses for photos on the Ring of Kerry. As Ambrose’s tour ended we were free to wander the gift shop and take a closer look at some of the factory equipment. Kim Clemons, a woman on our tour from Mattydale, NY, approached Ambrose with a question about her ring. 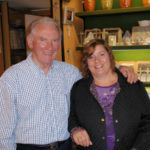 She asked if the stone, an heirloom from her grandmother, might be the same Connemara marble. To all of our surprise, Ambrose affirmed her theory and brought Kim over to meet his father, Ambrose Sr. To Kim’s shock and delight, Ambrose Sr. not only confirmed that the ring had been made in that very factory, but that he himself had cut the stone decades before. Kim had stumbled upon an almost unbelievable coincidence, and we couldn’t help but be moved to see the same man who had cut the ring for a grandmother clean up and polish the stone once again for her granddaughter. For such a small country, Ireland really does offer something for everyone. Accordingly, so did our tour. 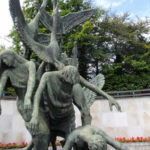 For history buffs, there was time to see the sights of Dublin and Galway and, at the Skellig Experience museum, learn the fascinating history of Skellig Michael, the forbidding rocky outcrop off the coast of Kerry where a determined order of monks erected a monastery in the 6th century. 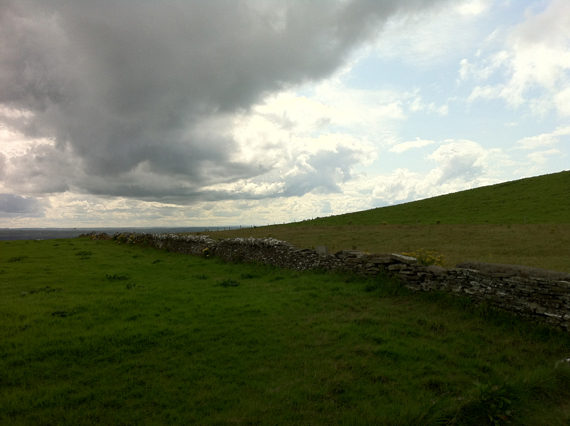 The main attraction, of course, was the landscape, which, no matter what the weather, was amazing each day. 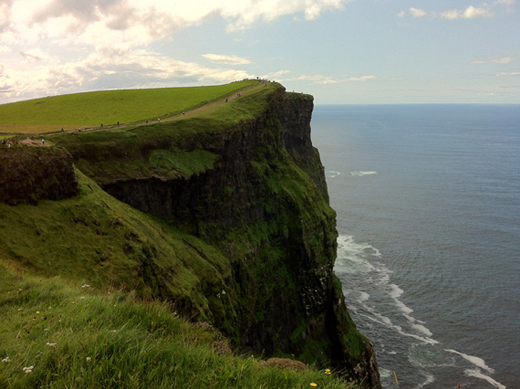 After the Giant’s Causeway, the Cliffs of Moher are probably the most mentioned, photographed and visited geological attraction on the island of Ireland. And after just two hours of gaping at them on the fourth day of the tour, we completely understood why. 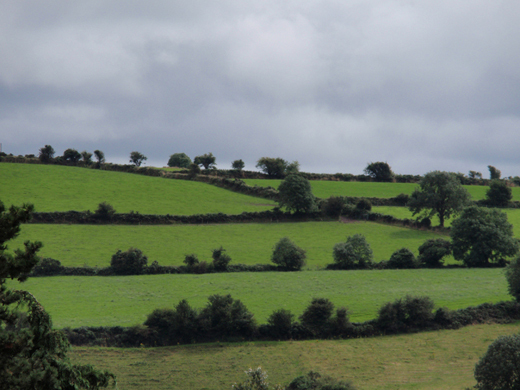 Fields lined by hedgerows on the Ring of Kerry. When we disembarked from the bus, we were greeted by the sight of a few hundred visitors ambling up the sloping cliffs while complacent cows resting in the nearby fields looked on. Wooden signs asked us to stay within the bounds of fences so low they seemed to know they were futile, as tourist after tourist hopped over and continued on the well-worn path along the cliff’s edge. We would have kept walking and staring, staring and walking, for hours had Pat and the rest of the crew not been waiting. The best night of the tour turned out to be the one for which we had the lowest expectations. 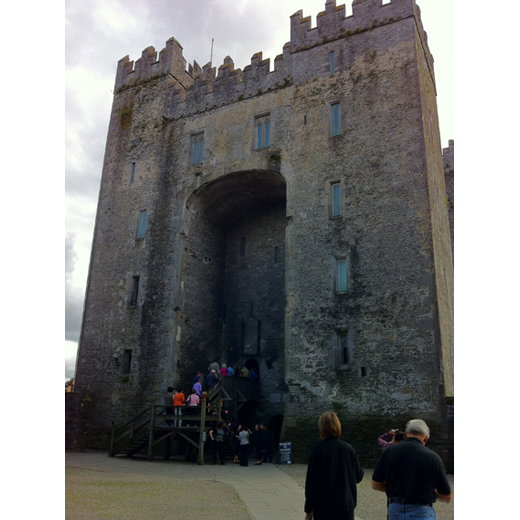 Our home for the fourth night was Bunratty Castle and Folk Village, in Co. Clare, just a short distance from Shannon Airport. The 15th century castle, which has been owned by a number of families, from the O’Briens to the Studderts, is now open to visitors, and hosts a great number each night for a musical, medieval banquet. Our inner children were of course excited, but our adult selves couldn’t help but wonder if we were a perhaps a little old for this sort of entertainment. Judging by the expressions of our fellow visitors as we were handed goblets of honey mead and greeted as lords and ladies, we weren’t the only ones with this concern. The man and woman randomly selected to be king and queen for the night looked none too pleased as they were given their crowns and instructed to order the crowd to the banquet hall. We shouldn’t have worried. The hosts, servers and masters of ceremony, who, in addition to moving the evening along were all incredibly talented singers and musicians, as adept at speaking in rhyming couplets as they were performing madrigals, maintained that delicate balance between knowing kitsch and genuine entertainment. By the time the banquet was in full swing, even the once-reticent king was gesturing royally and ordering subjects to the dungeon. Up until this point, I (Tara) had kept my identity as a musician pretty well under wraps to all our fellow tourists, so what happened next came as a big surprise to me. As the local players finished up a bar-wide sing-a-long of Glen Hansard’s “Falling Slowly,” I felt a hand on my back pushing me up front. Before I knew it, I was face-to-face with the burly musicians, who met me with some fairly skeptical expressions, until I asked to borrow one’s guitar. I played the first song that came to my head, an original song I’d written a year or two earlier. 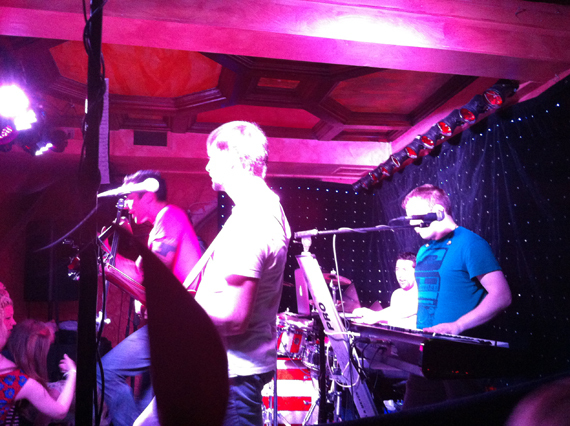 Much to my surprise, the rowdy bar was silent a minute into the song. 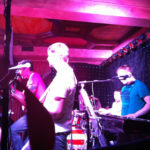 Three songs later, the intimidating, singing Irishmen were wiping tears away and I was back in the crowd shaking hands, exchanging emails and promising to send CDs. However, it really wasn’t until our loquacious tour guide Pat Smith told me, “I’ve been speechless twice in my life and you’ve just made me for the third. These guys are here every couple of nights. 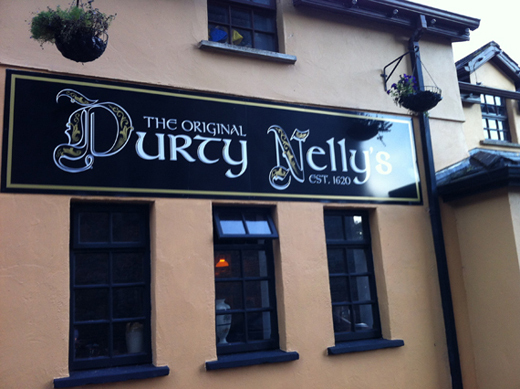 I don’t think you have any idea what you’ve done here” that I realized the significance of silencing Durty Nelly’s. It may not be the ten thousand seat stadium some musicians dream of, but it was more than a dream come true for me. I can’t wait to go back. 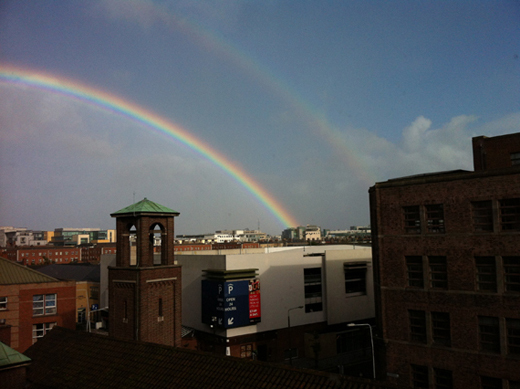 A double rainbow on our last day in Dublin. Galway, where we stopped on the last day, on our way back to Dublin, was the place we were the saddest to leave, and where we wished we’d had more time. Dashing off the bus and straight into the city center, we could sense just how alive, interesting and special a community Galway is, and we immediately began making grand plans to return another time for the Galway Arts Festival. After strolling along the Quay and High Street, and the little tributaries of streets branching off, it was time to treat ourselves with stops at Powell & Sons Music and a local book store. 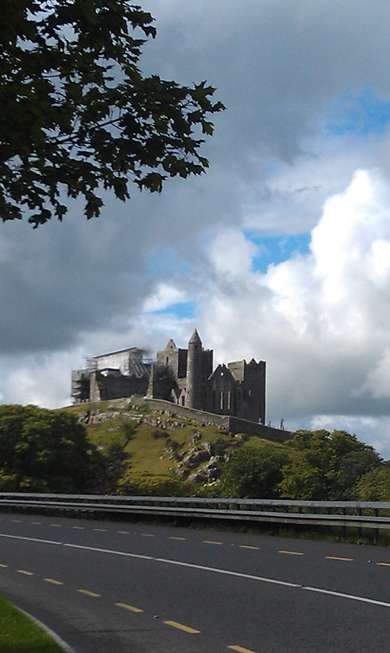 A view of the Rock of Cashel. 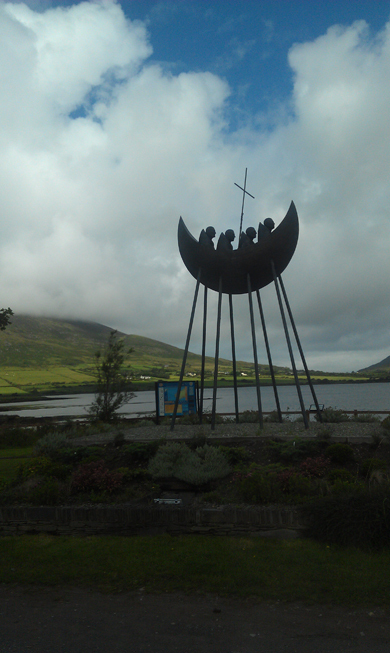 A monument to St. Brendan the Navigator near Cahersiveen, County Kerry. 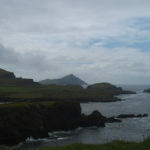 The vista from Valentina Island in County Kerry. 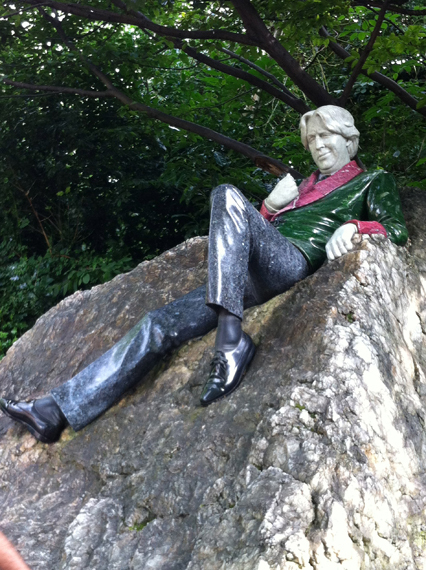 The Oscar Wilde statue in Merrion Square. Low clouds near the Cliffs of Moher. 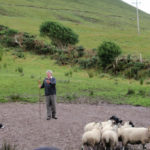 Brendan Ferris and his sheep herding demonstration. Waiting to board the ferry. 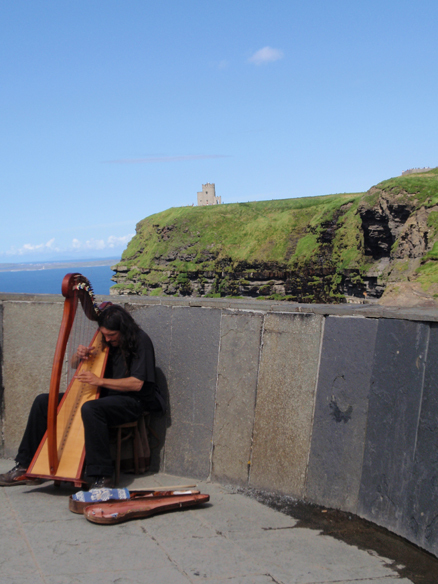 A harpist at the Cliffs of Moher. 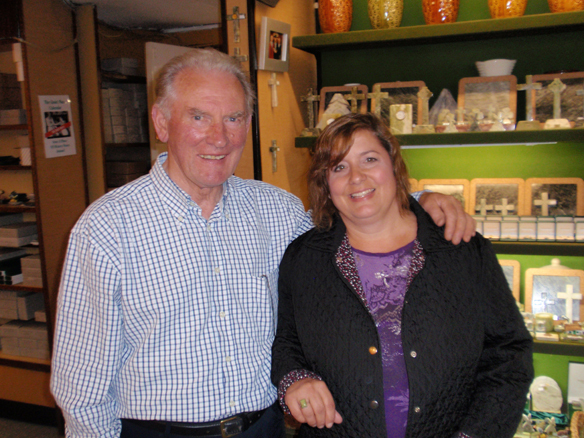 Ambrose Joyce, Sr. of Connemara Marble Factory and Kim Clemons, with her grandmother’s marble ring. 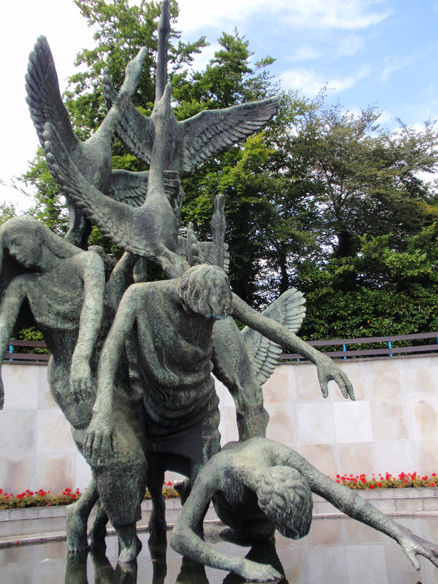 The Children of Lir statue at the Garden of Remembrance in Dublin. This article originally appeared in Irish America’s December / January 2013 issue. CIE, celebrating it’s 85th year in 2018, offers the largest selection of escorted coach vacations to Ireland, Scotland, England, and Wales. 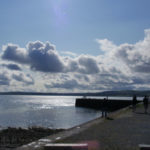 Tours last between 5 and 24 days and this year introduced new Family Collection Guided Vacations for the entire family ages 8 and up as well as new tours in Scotland, including an off-the-beaten-path journey to Scotland’s remote Outer Hebrides islands and a 5-star luxury tour with castle stays. With numerous awards from Scotland’s Heritage, Travel Weekly, Travvy Awards, Flight Center, TravelAge West, and Irish Tourism Industry, including their 2015 Best International Marketing Initiative Award. Visit the CIE website for more information on the many tours they have to offer, or view the 2018 brochure now. Click here for a chance to win a CIE Tours 5 day/4 night Taste of Ireland tour for two. That was absolutely beautiful. 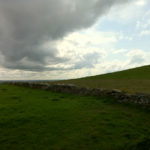 Your descriptions were perfect, and I appreciate “seeing” Ireland through your eyes. It sounds like you had a wonderful trip. I wish you both the best if luck, and many returns to Eire. I was sent this link as I was listening to live Irish radio with hosts that reply to email requests. Nice photos and written information that reminds me of my journey this July and August. Thoroughly enjoyed reading about your trip. Connected with the experience as a ‘local’ who has lived, worked, travelled & enjoyed the same roads. Reminds me in an odd way of similar encounters with equally interesting folk on a one-time visit to the US to connect with emigrated roots, in a reverse type scenario. Nicely worded, nice photos. I too took a bus tour after many trips to Ireland as a relative, etc. I thoroughly enjoyed the bus for the same reasons you did….no driving down narrow roads on the wrong side…..time to finish my pint…. Will you release your song? I’m set with my iTUNES ID and/or cash the day it goes on sale. Wondefully written, I enjoyed your piece. 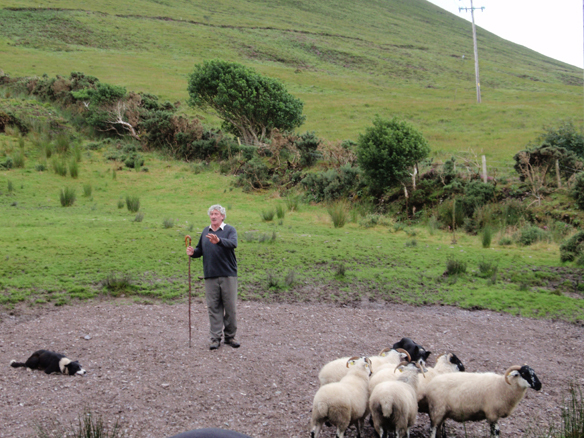 Fintan there will be a McCormick Clan Gathering in Ireland from the 9th – 11th of August 2013.